NIIT is a market-leading, global managed training services company with over 35 years of experience in learning outsourcing. With a team of some of the world’s finest learning professionals and presence in 40 countries, we help the world’s leading companies dramatically improve the effectiveness and efficiency of their training. 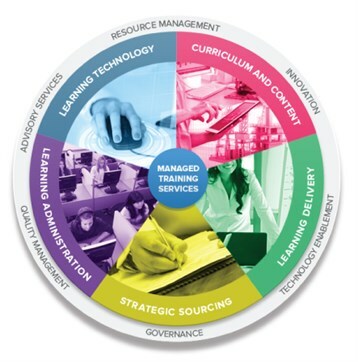 Our comprehensive suite of Managed Training Services includes custom Curriculum Design and Content Development, Learning Administration, Learning Delivery, Strategic Sourcing, Learning Technology, and Advisory Services. Built on the sound principles of ‘Running Training like a Business’, NIIT’s Managed Training Services and best-in-class training processes enable customers to align business goals with L&D, reduce costs, realize measurable value, benefit from rock-solid operations, and increase business impact. Through these services, we can take on the heavy lifting for clients so that their internal teams can focus on excellence in the work that is critical to do internally (e.g. business alignment). We have structured our practices so that each practice remains focused on what matters most – driving value; while also providing the benefits of top-notched managed services – scalability, process excellence, continual improvement, and cost efficiency. 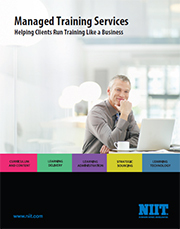 Is your organization running training like a business? Our free online self-assessment can help determine that. 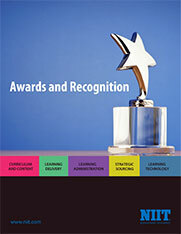 Get Your Score Our Transformation Framework helps transform training departments into training enterprises. Watch the video Unsure about the benefits of outsourcing?